Republicans seek answer to Trump drag after special-election setback in Pa.
WASHINGTON — Plan A apparently failed Republicans on Tuesday in Southwestern Pennsylvania. As they try to regroup from what looks like an embarrassing special-election loss, however, it's not clear what they have for Plan B — especially since Pennsylvania's leading Republican candidates for governor and U.S. Senate have so far taken the kind of Trump-like approach that just failed State Rep. Rick Saccone in the congressional contest. Running in deep red rural and suburban territory outside Pittsburgh, Saccone pledged his loyalty to President Trump, had help from two of Trump's famous rallies, and saw the GOP spend millions of dollars on his behalf, much of it centering on the president's signature tax bill. But none of that seemed to work against Democrat Conor Lamb, who appeared to have won the race in a district that previously backed Trump by 20 percentage points. Similarly, the GOP's leading gubernatorial hopeful, State Sen. Scott Wagner, and its top U.S. Senate candidate, U.S. Rep. Lou Barletta, have also campaigned on their stylistic and policy ties to the president. But with some members of both parties now arguing that Trump's poor approval ratings are dragging down the GOP and energizing Democrats, the results Tuesday and in other special elections across the country have left Republicans in tough battleground races groping for a playbook that can work. Some Republicans urged candidates to start developing independent messages to survive — especially in the Pennsylvania and South Jersey suburbs, where GOP incumbents face difficult races in much more moderate, competitive districts than their party lost Tuesday. "You have to establish a certain identity and independence," said Rep. Charlie Dent (R., Pa.). "No one ever wants to be seen as a rubber stamp." Earlier, the centrist from Allentown, who is retiring, told CNN: "Most Republicans realize they're running into a very serious headwind — hurricane-force wind." The GOP's Pennsylvania state chairman, Val DiGiorgio, said that simply linking a campaign to Trump "is not enough to win." "It's got to be about support for what works for Pennsylvania," DiGiorgio said, arguing that Barletta and Wagner can both provide their own platforms. Despite strong Democratic showings in a range of elections across several states, Barletta downplayed the Pennsylvania contest as a one-off event that turned on a strong Democratic candidate and weak Republican. He said he would not change his message, which has largely centered on his close ties to Trump and support for the president's agenda. "I don't believe that President Trump was the reason for this race being so close," Barletta said. 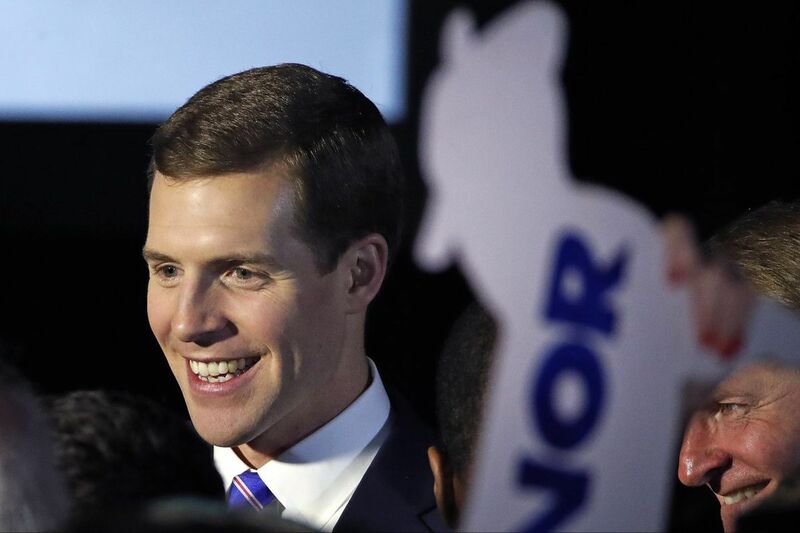 "Conor Lamb was a different type of Democrat than the Democrats here in Washington." Republicans previously argued that their tax cuts would be a political salve, but heavy advertising on the issue didn't dent Lamb in the special election in Pennsylvania's 18th District. It's unclear what else congressional incumbents might be able to offer. There is no major legislation that appears close to passage in Washington, and it's likely to get harder to move big bills as elections creep closer. "Republicans promised that these voters would applaud their tax plan, but after $10 million in advertising on it, these voters were appalled by it, not applauding it," said Jesse Ferguson, a strategist who previously worked for Democrats' national congressional campaign arm. The idea of Republicans atop the Pennsylvania ticket continuing to campaign as Trump allies, he added, is "a pretty toxic brew, especially in the more competitive battlegrounds that will make up the midterms in Pennsylvania." Midterm elections are usually referendums on the president, and polling has shown Trump struggling badly among suburban voters. A Monmouth University poll this month found that likely voters in the special election were evenly split on Trump's job performance, despite the major support he had there in 2016. "Clearly the biggest thing hurting Republican candidates the past year and two months has been Donald Trump," said Rep. Brendan Boyle, a Philadelphia Democrat. In a string of special elections across several states, Democrats have averaged a 17- to 18-percentage point increase over their previous showings, he said — a sign of their party's enthusiasm and some voters turning against Trump. "Given that historically high number, it amazes that you haven't seen more Republicans attempt to distance themselves from Trump." Other Democrats may not be as moderate as Lamb, but they won't have to run in such conservative turf. In suburban districts around Philadelphia and other cities, they start with far better odds, and the special election provided another example of those communities moving away from the GOP. Lamb captured 172 precincts that backed Trump, according to a breakdown from the election analysts at DecisionDeskHQ — mostly in affluent suburbs just outside Pittsburgh. Those are the kind of places, similar to Chester County or parts of South Jersey, that Democrats are targeting as they try to take control of the House this fall. Among those facing a difficult challenge is Rep. Ryan Costello, who represents a Chester County-based swing district that Trump lost and that moved left in the recent redistricting imposed by the state Supreme Court. Costello has told GOP officials that he was uncertain if he would seek reelection, given the shifting map and brutal political environment, according to four Republican sources. Costello is still circulating petitions to campaign but has not definitively said if he will run, leaving Republican leaders worried about having to scramble to find a replacement if he bows out. Asked Wednesday about his plans, Costello pointed to his petition drive but did not say if he is definitely running. Ohio Rep. Steve Stivers, the head of the GOP congressional campaign committee, warned his colleagues Wednesday morning that the Pennsylvania race should serve as "a wake-up call." Others, however, downplayed the result as a fluky upset. "Better campaigns are going to produce better results," said Charlie Gerow, a GOP analyst based in Harrisburg. He joined those, however, in warning that Republicans cannot simply hitch their efforts to Trump. "I believe that a significant number of rank-and-file Republicans are now looking at a different approach," Gerow said.